This modular rodent has an OLED display. Back at the Consumer Electronics Show earlier this year, peripheral maker SteelSeries introduced the world to its Rival 700 mouse, what it claimed was the first-ever gaming rodent with a fully customizable onboard OLED display. If you've been patiently awaiting its arrival, it's now available to order in North America exclusively at the company's website. Why would you want an OLED display on your mouse? Good question. The answer from SteelSeries is that it can be used to track in-game stats, change profiles, see mouse sensitivity settings at a glance, display custom logos and animations, and so forth. The Rival 700 can also provide tactile alerts to in-game events. Subtle pulses let you know that you're low on health or ammunition, or whatever other warnings you configure it for. These alerts are felt in your palm and supposedly never impact the mouse's tracking. "To have my Rival 700 notify me when my cooldowns are up is a total game changer," said Jonathan ‘LodA’ Berg, Professional Dota 2 player currently playing for team Alliance. "The Rival 700 not only gives me an edge during intense battles, but also adapts to my moods and preferences." The Rival 700's matte top cover is interchangeable with others that have different designs and surfaces, which will be available in spring. You can also swap out the 16,000 CPI sensor. Other features include 7 programmable buttons, including reinforced left and right clickers, and two cable options (1m rubber cable for notebooks and a 2m braided nylon cable for desktops). 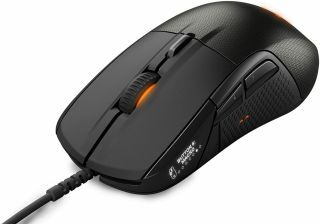 You can order the Rival 700 at SteelSeries' website. Also, be sure to check out our picks for the best gaming mice.